Looking for the perfect gift for the lady in your life? The Montana Spa Box is a perfect fit - Trust us, she'll love it! 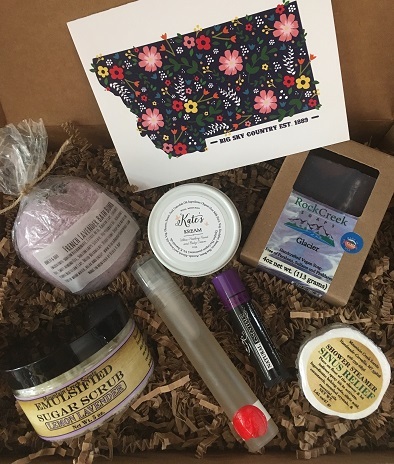 The Montana Spa Box includes the "Big Sky" soap bar from Rock Creek Soaps (Billings), a Sinus Relief Shower Steamer from Mountain Creek Scents (Corvallis), "Kate's Kream" Ultra Healing Hand and Body Cream from Kate's Mercantile (Hall), Lemon Lavender Emulsified Sugar Scrub from Mountain Creek Scents (Corvallis), French Lavender Bath Bomb from Birch & Bay (Billings), Huckleberry Lip Balm from Natural Essentials (Churchill), Rose Water and Silk Facial Mist from Recherch'e Organics (Bozeman), and a welcome/gift card from KTF Designs (Butte). **This box is separate from the monthly subscription, and can be shipped anytime. We use USPS 1-3 priority mail, and generally ship your box 1-3 days after you place your order. Contact us if you have any special instructions!